You might equate velvet to winter but it makes a lovely covering to any piece of furniture, which is why it’s a popular all-year-round fabric. It’s actually one of my favourite upholstery fabrics – it stands out and adds depth and definition to the shape of a piece. Several types of velvet are washable and stain resistant, without compromising on the look. And, they’re not too costly. Pure velvet: Made of an acetate/viscose mix with an opulent sheen, this type is considered to be the most luxuriant. Silk velvet: One of the most luxurious fabrics ever created. Soft and smooth to the touch, it gives the impression of being wet. Best suited for pieces that will not get heavy use and can fade in sunlight. Linen velvet: Has a matte, dry look and often has a ‘strie’ (subtle, irregular striping) because linen yarns tend to have different thicknesses. Its pile is usually shorter than that of other velvets, and it’s prone to bruising or crushing. Cotton velvet: Crushes easily, which is why it’s often blended with another fibre, such as polyester, to improve its resilience. It has a matte finish, but can be blended with viscose to add lustre and strength. Wool velvet: Durable and resilient, it can be warm to the touch - not so great in the summer. Mohair velvet: Made from the hair of Angora goats is extremely durable and resists dirt and crushing. If a piece is going to be heavily used, mohair is the gold standard. It’s very thick, and has less sheen than silk or cellulose fibres. Cellulose velvets: Cellulose is a manufactured fibre made out of plants or wood pulp. 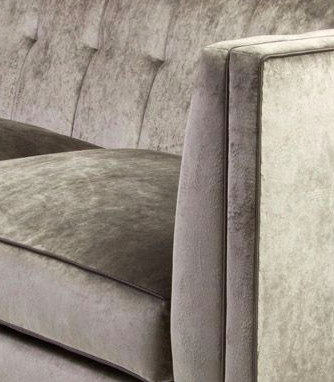 Such velvets are soft and have a deep lustre, giving the natural fibres some competition in the glamour department. Synthetic velvets: Velvets made from high-quality polyester are less prone to marking or crushing. They resist fading, but don’t have the same depth of colour as natural fabrics. Blend the two and you have the best of both worlds. Cut velvet: Not a specific fibre, but rather a fabric that has a pattern cut into the velvet. The pattern can be any design, from traditional florals to more modern geometrics. So, now you know about the different types of velvet that are out there, it’s time to choose.